Hi guys, today, I wont be sharing any tips or cheats involving kitchen stuff. Instead, I'm going to teach you some basic mandarin that can be applied on daily basis. Why i decided to pick mandarin as my new project for article? Well, Malaysia are a diversity where the society from numerous background co-exist. So, it wont hurt to learn few basic words right? I will be teaching you basic words of mandarin characters, their hanyu pinyin and the meaning of the characters. Hanyu Pinyin? What are those? I'm sure some of you are familiar with them right? For those who are not, dont worry, I do provide explaination. Hanyu Pinyin is the official romanization system for Standard Chinese in mainlain China and to some extent in Taiwan. It is often used to teach Standard Mandarin Chinese, which is normally taught using Chinese Characters. The system includes four diactrics denoting tones. Pinyin without tone marks are usually used to spell Chinese Names or words in languages written with the Latin Alphabets and also in certain comouter input methods to enter Chinese Characters. Hanyu Pinyin: duì. bu. qĭ. Hanyu Pinyin: wŏ. yě. shì. 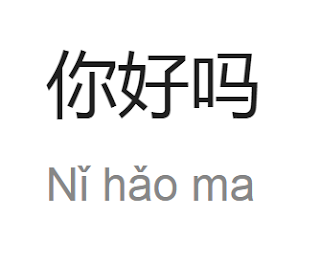 Meaning: Me too, Same here, So do I.
Hanyu Pinyin: dāngrán. kě. yĭ. Meaning: Of course not, Why not, Sure. Meaning: Thank you soo much, Thank you, Thank you for your help. Meaning: Go for it, You can do it, All the best. Meaning: Goodbye, Take care, See you. Hanyu Pinyin: wŏ. wàng. jì. dài. le. Meaning: I didn't bring it, I forgot to bring it.